Postcard showing Lake Eola Park and its Bandstand in Orlando, Florida. The bandstand is on the west side of the park. Lake Eola and its surrounding park are one of the unusual features that sets Orlando apart from other cities. From its earliest days, Downtown Orlando was situated on the west side of the lake. As the town grew into a city, Lake Eola continued to be a focal point for the inhabitants, who used the lake for bathing, swimming and fishing, and its shores picnicking, listening to concerts, and participating in religious services. Much of the land around Lake Eola was donated to Orlando by Jacob Summerlin who designated that it be a public park. It has remained one ever since. The rest of the park land was donated by the Musselwhite Family and Mayor Frank Sperry. Original 5.5 x 3.5 inch color postcard by Genuine Curteich-Chicago: Orange News Company, Orlando, Florida: Private Collection of Thomas Cook. Digital reproduction of original 5.5 x 3.5 inch color postcard by Genuine Curteich-Chicago: Orange News Company, Orlando, Florida. Originally created by Genuine Curteich-Chicago and published by the Oranges News Company. Copyright to this resource is held by Genuine Curteich-Chicago and is provided here by RICHES of Central Florida for educational purposes only. O-26--Bird's-Eye View of Tropical Lake Eola Park and Band Shell, Orlando, Fla. "The City Beautiful." ORANGE NEWS COMPANY, ORLANDO, FLA.
Genuine Curteich-Chicago. 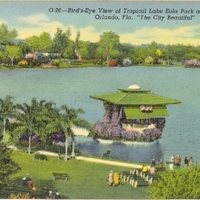 “Bird's-Eye View of Tropical Lake Eola Park and Band Shell Postcard.” RICHES of Central Florida accessed April 21, 2019, https://richesmi.cah.ucf.edu/omeka/items/show/975.